An application I told you about in September, for an all-sports radio station at 850AM, was published on Wednesday by the CRTC and will be considered at a hearing in March. The proposed station would be the third AM talk station in Montreal owned by TTP Media (officially 7954689 Canada Inc.), a company formed by partners Paul Tietolman, Nicolas Tétrault and Rajiv Pancholy. The trio’s other two stations, already approved by the CRTC but yet to launch, are for a French-language news-talk station at 940AM and an English-language news-talk station at 600AM. They are expected to go on the air simultaneously some time this year. As was the case for its previous applications, TTP likes to talk big about how it’s going to revolutionize radio with ideas no one else has tried before. This station is no different. For one thing, there won’t be a focus on live broadcasts of sporting events. Unlike TSN Radio in English, which has things like European soccer and NFL football games broadcast live, the TTP station plans to have zero syndicated live sports programming. Instead, it will be locally-produced sports talk, 24 hours a day, seven days a week (they’re even willing to accept a condition of licence to this effect). Pancholy told me there might be some live local sports coverage, but the focus will be on discussion (which one would imagine would be mainly Canadiens-related) outside of games. This is interesting, to say the least. Team 990 went a decade without rights to Canadiens games before it finally got them from CJAD in the hope that that would bring them back into the black (it didn’t, but the station hopes that the move to 690AM will push it over the break-even mark). On one hand, people love to rant about their Canadiens. On the other hand, they’re more likely to do that on a station that carries the Canadiens broadcasts. Or at least that’s the conventional wisdom. Programming details will have to wait until the station is approved, but the application said they expect a total of four hours a week of hard news, and 126 hours (i.e. every minute of the week) of local programming. Online is the perfect place to offer up stats plus extended commentary and analysis. Using social media is an ideal way to further engage listeners in debate and discussion. A strategic use of cutting edge technology will insure that AM850 remains contemporary, immediate and relevant. The application comes in the wake of the decision from owner Cogeco to replace CKAC Sports with Radio Circulation in September 2011. That move, which came after it became clear there was resistance to a move to reactivate 690 and 940 for government-subsidized all-traffic stations in English and French, left Canada’s largest French-language market without a full-time sports talk station. Instead, Cogeco’s news-talk station CHMP 98.5FM has adopted a hybrid format, with news and information during the day and sports talk during the evenings, including live broadcasts of Canadiens and Alouettes games. (Montreal Impact games are not broadcast on radio in French in Montreal). Though that decision has been criticized, and CKAC’s market share is only a tenth of what it was as a sports station, CHMP’s ratings have soared, and it’s now the top-rated station in Montreal. TTP’s application focuses on the void left by CKAC and the need for sports talk during the day. The proposed frequency, 850AM, was previously used by Montreal’s CKVL (a station founded by Tietolman’s father, Jack Tietolman). That station changed frequency and was transformed into Info 690 in 1999, and 850 has been vacant here ever since. But rather than bring the station back using its previous parameters, TTP has suggested a new setup with an improved signal. The transmitter would be located in a wooded area off Don Quichote Blvd. in Notre-Dame-de-l’Ile Perrot. There’s no transmitter site there, or towers, or anything. But it’s an ideal location for the coverage pattern they want to create. Because it’s not a clear-channel station, it has to adjust its pattern to protect distant stations at night on the same frequency. The trickiest one is WEEI 850, a 50,000W station in Boston. This limits the proposed station’s pattern to the southeast. There’s also WKGE in Johnstown, Pa. (10kW), CJBC in Toronto (Première Chaîne at 860 kHz), WAXB in Ridgefield, Conn. (500W), as well as clear-channel stations in Denver and Alaska that are too far to be a real concern. The station must also protect potential stations, patterns that are allocated but where no station is currently transmitting. (For the most part, these are patterns that used to be used by AM stations that no longer exist or that have changed frequency.) These include allocations in Timmins, Ont., Spaniard’s Bay, N.L., and Enola, Pa., on 850, plus adjacent-channel allocations in Drummondville (820), Brockville, Ont., (830), Rivière-du-Loup (840) and Quebec City (870). The proposed station was originally going to be 50kW day and night, but that had to change after the Federal Communications Commission in the United States noticed that the station would interfere with WEEI. The technical application had been based on incorrect data, and the new data showed an unacceptable interference. TTP responded with the simplest solution, which is to reduce its nighttime power to 22kW, but it says it may try another solution if it comes up with something better later on. The proposed signal also encroaches on the allocated pattern for the Spaniard’s Bay station. The community, just west of St. John’s, was served by AM station CHVO on 850 until 1990, but the allocation remains active. TTP proposed reducing the Spaniard’s Bay allocation’s contours slightly, arguing it would be better for the broadcasting system as a whole, and the advantages to the Montreal station (which would, you know, actually exist) would far outweigh the disadvantages to an AM allocation that might never be revived. Taking all these protections into account, TTP decided the best move was to point the signal toward to the northeast (around 35 degrees). 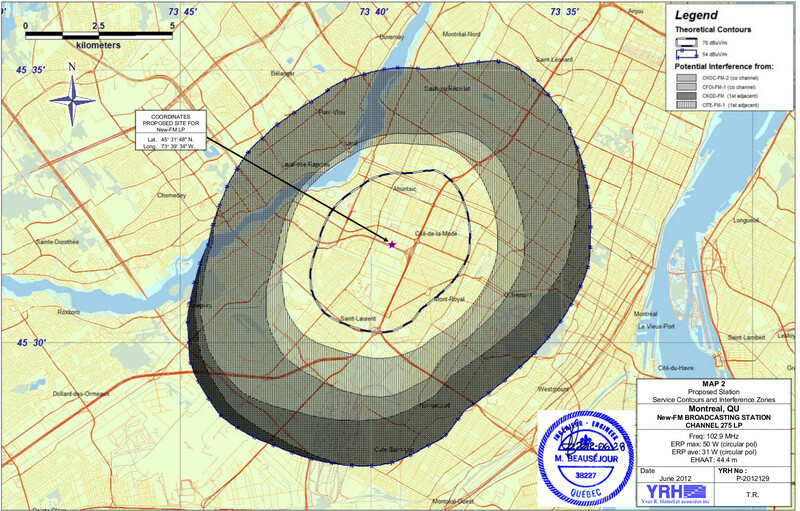 Putting the towers on Île Perrot maximizes the population inside the coverage area for a signal pointed in that direction. The proposed transmitter setup is four towers 88.2 metres high spaced 98 metres apart, in a line pointing toward Montreal. The signal would be very directional, with the 0.5mV/m contours reaching almost to Quebec City 250km away but barely grazing towns like Hawkesbury, Cornwall and Hemingford which are only about 50km away. The signal would be excellent in the lower West Island (somewhat ironic since it’s a French station) but would cover Montreal and both shores pretty well. Building a new transmitter site won’t be cheap. The application lists $1.5 million for transmitter setup costs, plus $63,000 in annual rent. The project could also be the subject of hearings if residents nearby object. Pancholy didn’t want to discuss details of potential hearings, but said that things were moving along well in terms of getting approvals necessary for the transmitter site. TTP’s other two stations will use a transmission site in Kahnawake owned by Cogeco on rented land. This site was deemed inadequate technically for the 850 station. The financing for the proposed station would, like with the others, be through a combination of personal financing from the partners and a bank loan. The application lists $5 million in total financing, which breaks down as $1 million from the owners and $4 million in debt from James Edward Capital. But the station’s optimistic budget shows a quick profit turnaround. With $3.5 million in annual revenue, increasing to about $5 million by the end of the first seven-year licence term, the station expects to be making money by the fourth year of operation. Expenses would start at $3.6 million a year and rise to $4 million a year by Year 7. Though TTP would argue its projections are conservative, its competitors would say they’re unrealistic. 20% of our revenue will be derived from advertisers which do not currently advertise on existing radio services. 20% of our revenue would result from increased spending from advertisers which currently advertise on existing radio services (given this unique targeted opportunity). 15% of our revenue will come from our online/web site offerings. The remaining 45% of our projected revenues will come from existing radio services. The application doesn’t list the number of jobs the station would create, and Pancholy didn’t want to come out with a number. Many administrative jobs would be shared among the stations. The application makes reference to “a special intern program”, which suggests that unpaid interns might be a big part of the plan here. (Cheap and free labour is certainly a large part of the tight-budgeted TSN Radio). The CRTC has called a hearing in Gatineau on March 20 to consider this application and others. Unless there are significant objections, the commission plans for these to be non-appearing items, meaning that the applicants won’t have to appear at the hearing and there will be no actual discussions. After the hearing, the commission will take a few weeks (or a few months, it’s really up to them) to make a decision. Once the station is approved, it will have two years to launch, though Pancholy said they would expect it to be up within a year of a positive decision. What do you think? Does this business plan sound plausible? Are people more interested in talking about sports than listening to live matches? Can you have a sports talk radio station without any live sports? Leave your comments below. The Journal de Montréal/Agence QMI has a story on this. Its headline says there will be a decision this summer, but no source is provided for that statement, and I doubt the commission has confided that detail to the reporter. It’s a good guess, but it’s a guess. The decision could be done by the end of April, or they might still be waiting for one in October. It’s really up to the commission.